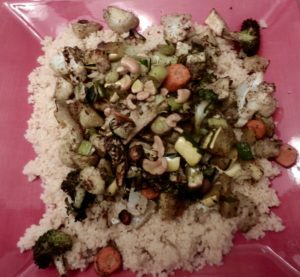 Note: In my earlier posting (https://www.menupause.info/archives/20094), using more vegetables is on the list of heart healthy recommendations, so I thought this dish, suggested by my yoga buddy Joann, would be a good choice for February. I made it for a food demo last month and I think this one was the favorite of all the dishes. To make it more nutritious, use whole grain couscous, and for a gluten-free version, use Riz Cous (made from rice to resemble traditional couscous). 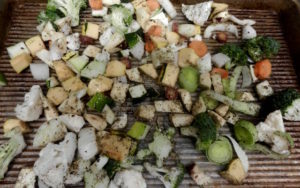 3-4 cups diced or sliced (organic) veggies of your choosing, such as: carrots, cauliflower, leeks, rutabaga, celeriac, delicata squash or sweet/white potato, fennel, carrots, bell peppers, zucchini, garlic, etc. 1-2 tsp. Za’atar or other herbal blend of your choosing, ex. curry powder, Italian herbs, ginger, etc. Wash all veggies, then slice or dice, depending on the veggie. For example, thinly slice carrots, leeks, delicata squash, and any additional root veggies because they take longer if too thick. On the other hand, potatoes do best diced, and perhaps peppers and cauliflower. Experiment! Toss sliced and diced veggies with oil and herbs. Spread a little extra oil onto a small baking pan. (Sugg: 2 Tbl. for veggies & one for pan.) The picture below depicts veggies before baking. Place tossed veggies onto lightly oiled pan with little or no overlapping and bake until crunchy-tender. Depending on your own taste, test the veggies every few minutes. I suggest about 20 minutes, if the pieces are diced and thinly sliced. While the veggies are roasting, follow directions for couscous. Companies generally recommend twice as much water or stock as grain. Once the boiling liquid is poured overr the grains, cover and allow liquid to be absorbed. Fluff with a fork and add a touch of oil if you wish. couscous takes less than 15 minutes total, so you can make it while veggies are roasting. Remove cooked couscous from saucepan and spread onto a platter. (feel free to add a little oil.) Top with veggies from the oven and serve as is, or feel free to add slivered almonds or sesame seeds for added crunch. Variation: Add cubed, firm tofu to the veggies for a protein boost. Serves 3-5 depending on if it is a side dish or main dish. This entry was posted on Wednesday, February 15th, 2017 at 3:21 pm	and is filed under Kitchen Nutrition. You can follow any responses to this entry through the RSS 2.0 feed. You can skip to the end and leave a response. Pinging is currently not allowed.